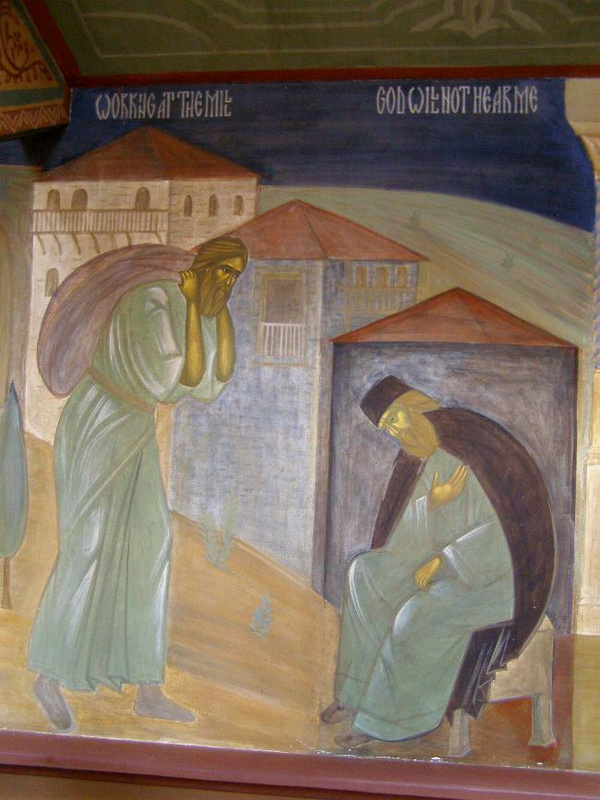 Let us praise the divine Akylina, whom I behold as a godly-minded girl and Champion of Christ, who watered the faith with her love for Him, and deposed the enemy through her holy struggles, and was granted divine glory. And she entreats Christ the Word that He be merciful to our souls. Zagliveri rejoices in your struggle, the village that sprouted you as a fragrant flower, O most-comely virgin of Christ Akylina, for you struggled steadfastly, and received from God the crown of incorruption. Entreat ceaselessly that He be merciful to our souls. 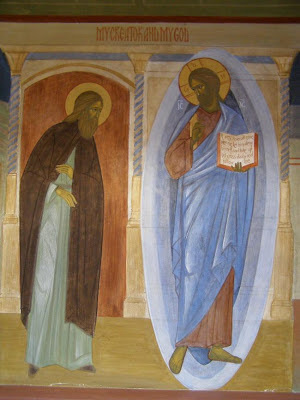 Today, as noetic spring, the memory of the Neomartyr Akylina has dawned among the hardness [of hearts], making glad the faithful, for as a flower of the field, she bloomed amidst a perverse generation, as her athletic grace compels us to cry out: hail, you who deposed the ancient enemy in a fragile body, through the power of the faith. Hail, O glorious Virgin-martyr, the newly-shining lamp of the Church of Christ. Hail, the sacred blessing of your place of origin, and their protector and defender and divine refuge. Intercede with your Bridegroom, that we who celebrate your memory be saved from every need. Though fragile in body, you deposed the enemy who greatly wars against us, through your radiant struggle, O Virgin, and you hastened, bearing a lamp, to your Bridegroom, Who crowned you with the crown of radiant incorruption. And you entreat, O Akylina, on behalf of those who praise you in faith. The all-sacred memory of the Champion has dawned as a moon-bearing star, calling together the faithful to praise the feast. 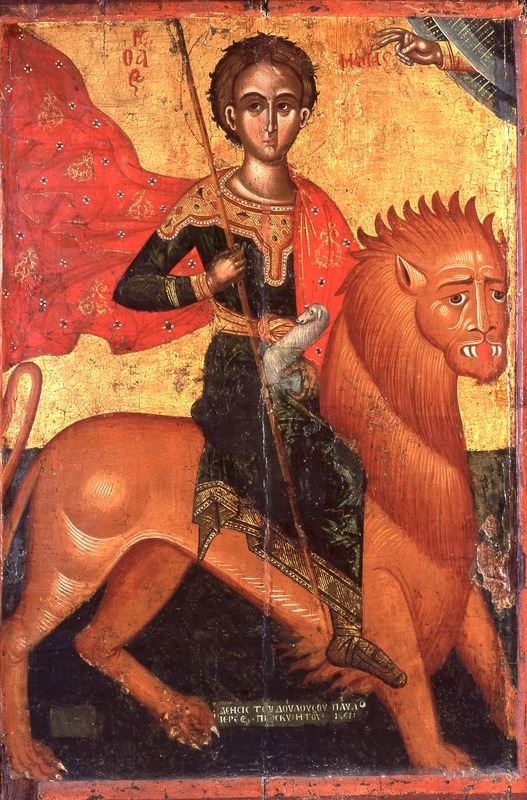 Let us all gather on behalf of this, and bring to mind these paradoxical things that we behold of the Martyr Akylina, who for the faith, and furthermore with bravery, and unconquerable endurance, through the power of Christ, and in a fragile and feeble body of infirmity, was shown as utterly radiant. Through her surpassing boldness, she trampled upon the enemies as upon the play-things of children. These unspeakable things and wondrous feats the Martyr worked through the faith of Christ, as she overcame the false pretenses of the tyrannical kingdom. 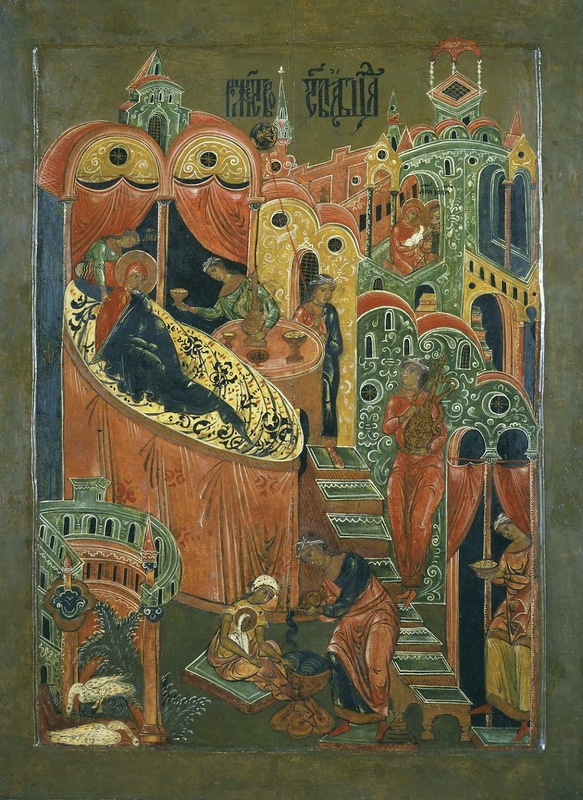 And she endured painful beatings, and lawfully struggled, offering herself to Christ the Savior as a pure offering, Whom you entreat, O Akylina, on behalf of those who praise you in faith. On the 27th of this month (September), the Holy Martyr Akylina, who was beaten with rods, and was thus perfected in martyrdom. Was shown a man in bravery towards tortures. Akylina struggled on the twenty-seventh. For the full service to St. Akylina the New Martyr in Greek, see: http://voutsinasilias.blogspot.com/2012/09/27.html. 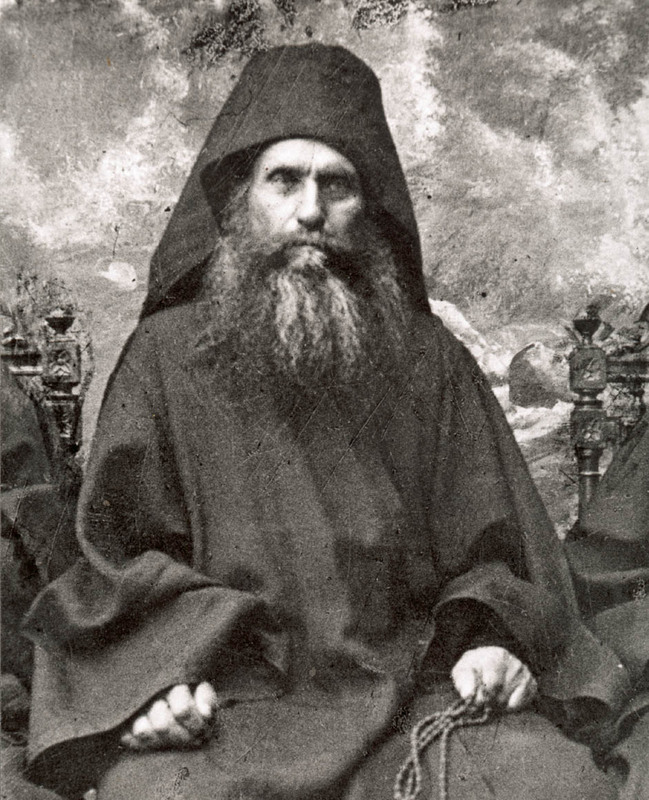 On this day we keep the memorial of our sacred father Silouan whom God inspired, who lived the monastic life upon the Holy Mountain in the Russian Monastery of the Holy and Great Martyr Panteleimon, and who died godly in the Lord on the twenty-fourth day of September in the year of our salvation 1938. Not darkly as in a glass. And from that sylvan mountain heaven has now received thee. 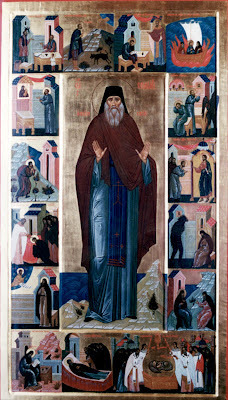 Saint Silouan, that citizen of the heavenly Jerusalem, was born of pious parents in the land of Russia in the village of Shovsk in the diocese of the Metropolitan of Tambov. He came into the world in the year of our Lord 1866, and from a young man was called to repentance by the All-Praised Mother of God and ever-Virgin Mary. 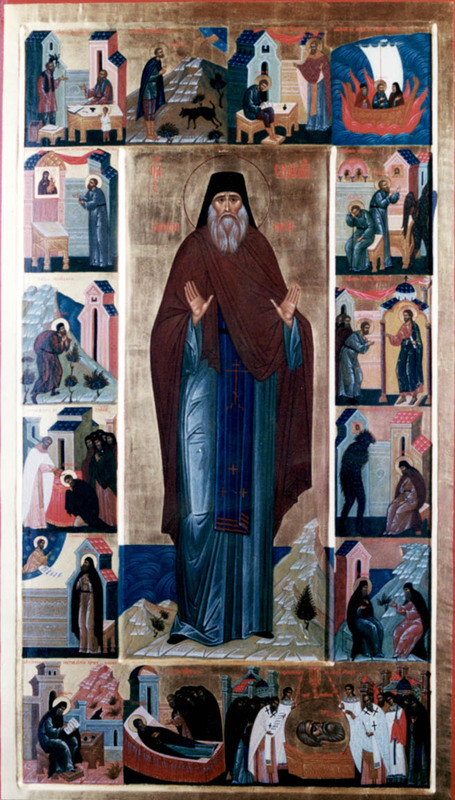 When he had reached his twenty-seventh year, he renounced the things of this life, and, with the prayers of Saint John of Kronstadt to speed him on his way, he set forth for Greece and the illustrious Holy Mountain. 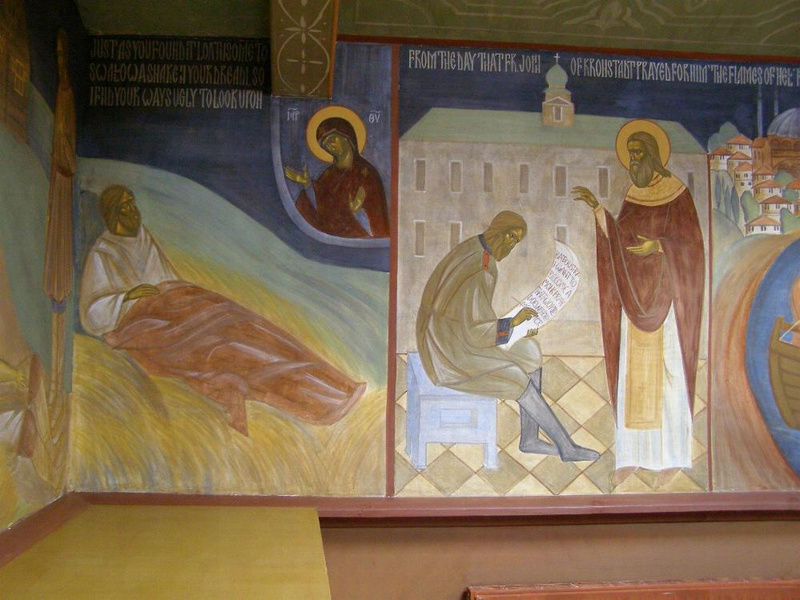 Here, in the cloister of the Holy Great Martyr and Physician Panteleimon, he took upon him the yoke of the monastic life. Thus he gave himself to God with all his soul, and in a brief while he not only received the gift of unceasing prayer from the Most Holy Mother of God, but was also granted ineffably to see the living Christ in the chapel of the Holy Prophet Elijah that was next to the monastery’s flour mill. Sitting in his cell before vespers, he thought, 'God will not hear me!' He felt utterly forsaken, his soul plunged in the darkness of despondency. Sick at heart, he remained in this black hell for about an hour. 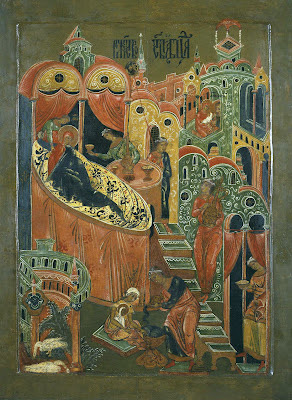 That same day, during vespers in the Church of the Holy Prophet Elijah (adjoining the mill), to the right of the Royal Doors, by the ikon of the Saviour, he beheld the living Christ. In a manner passing all understanding the Lord appeared to the young novice whose whole being was filled with the fire of the grace of the Holy Spirit - that fire which the Lord brought down to earth with His coming. But this first grace was taken away, and the saint was constrained by anguish and great grief, and with God’s permission for fifteen years he was given over to manifold temptations of spiritual foes, and so he followed in the footsteps of Christ, having offered up prayers and strong supplications with strong crying and tears unto Him that was able to save him from death (Heb. 5:7), being taught by God through a voice from above that gave him this commandment: "Keep thy mind in hell, and despair not." [The phrase 'keep thy mind in hell and despair not' may sound strange or discouraging. 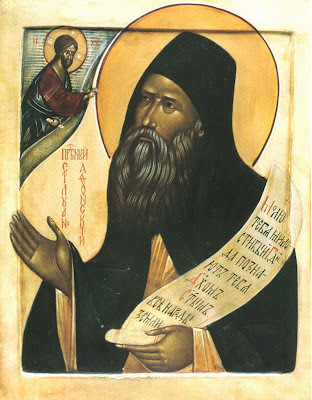 Archimandrite Sophrony explains how it instead is an important part of the normal spiritual progression in which pride must be overcome. 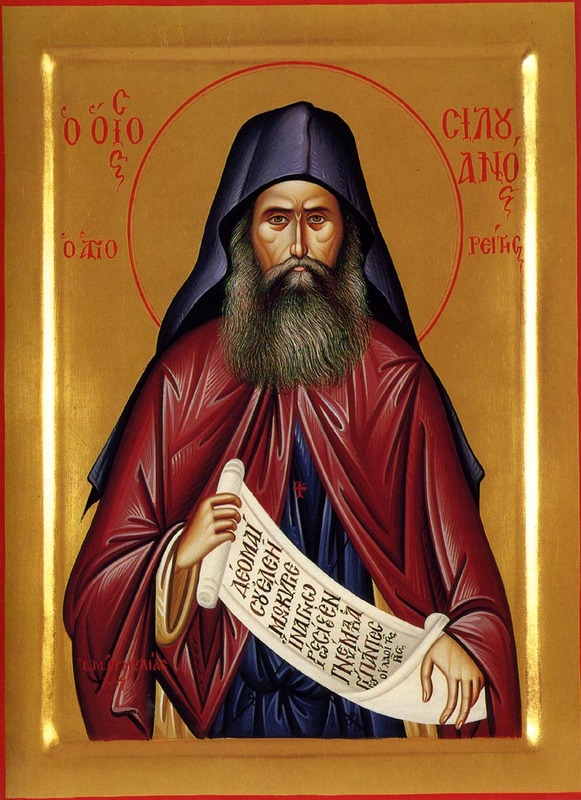 We also see that knowledge of God, our salvation, is not a purely rational or intellectual process but is instead one of true relationship (from St. Silouan the Athonite, pages 143-144). Whatever the means he employs, the proud man will never attain to genuine union with God. Just by wishing it, man cannot unite the mind with the deep heart, and even if the mind does somehow penetrate into the heart, it will see only itself, its own created beauty - splendid, undoubtedly, having been created in the Divine image - but God Himself will not be found. [The passage from Archimandrite Sophrony also clarifies the phrase 'keep thy mind in hell and despair not', showing how the struggle against pride is difficult, though an important part of the spiritual life (from St. Silouan the Athonite, page 210). Keep thy mind in hell, and despair not. What does it mean - to 'keep the mind in hell'? Can it be that we are to use our imagination to conjure up circumstances for ourselves similar to those figured in some primitive painting? In this instance, no. 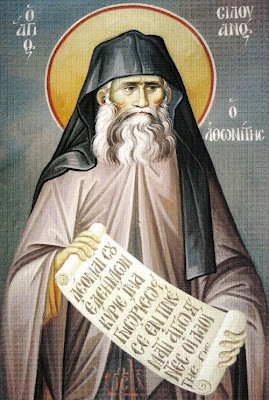 Father Silouan, like certain great Fathers - St. Antony, St. Sisoë, St. Makarios, St. Pimen - during his lifetime actually descended into the darkness and torments of hell They did this not once but over and over again until their hearts were so permeated that they were able to repeat the movement at will. They took refuge in it when passion - especially that most subtle of passions, pride - reared its head. This he observed as an infallible rule, and so ran the way of Anthony, Makarios, Poemen and Sisoes, and the other celebrated preceptors and fathers of the desert, to whose measure and spiritual gifts he also attained, and was manifested an apostolic and inspired teacher both living and after death. The saint was wondrously meek and lowly in heart, a fervent advocate before God for the salvation of all, and unequaled among teachers: For he says that there is no surer proof that the divine Spirit dwells within us than that we love our enemies. This blessed Saint Silouan passed over from death to life, full of spiritual days on the twenty-fourth day of September in the year of our Lord Jesus Christ 1938: To Whom be glory and might forever and ever. Amen. Through his prayers and those of all Thy Saints, O Christ our God, have mercy on us and save us. Amen. For additional icons from the life of St. Silouan the Athonite, see: http://agioritikesmnimes.pblogs.gr/2011/03/2246-o-agios-siloyanos-o-athwniths-se-toihografies-ths-monhs-toy.html. 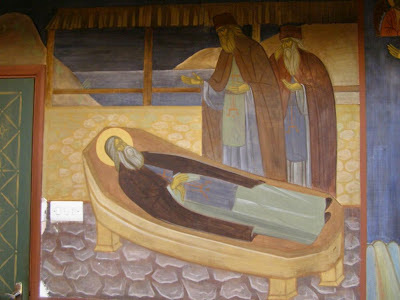 For the service to St. Silouan in English, see: http://silouan.narod.ru/silnews/news25.htm#Text1. By prayer didst thou receive Christ for thy teacher in the way of humility; and the Spirit bare witness to salvation in thy heart; wherefore all peoples called unto hope rejoice this day of thy memorial. 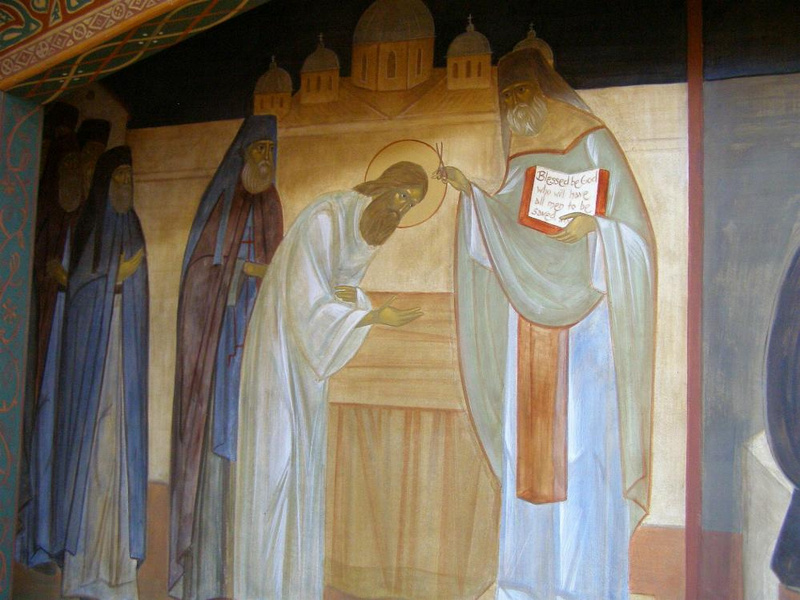 O sacred Father Silouan, pray unto Christ our God for the salvation of our souls. In thine earthly life thou didst serve Christ, following in His steps; and now in heaven thou seest Him Whom thou didst love, and abidest with Him according to the promise. Wherefore, O Father Silouan, teach us the path wherein thou didst walk. Let us sing a new song, O faithful, to the righteousness of the Lord King, and let us confess, or better yet, let us hymn and glorify, and praise, and worship, and magnify the presence of our Lord and God and Savior Jesus Christ, and in hymns let us venerate and praise the honored and thrice-blessed wood of the Master. Come, O beloved, in song let us dance and praise in faith, and together with the Prophet David let us chant and say: “Let the light of Your countenance shine upon us, O Lord.” (Psalm 4:6) What other light is there, other than the cross of our Lord and God and Savior Jesus Christ, through which the world was saved, and those who believe were delivered from slavery to Belial, and the writ of our sins was torn apart? Christ is the countenance of the Father: “He who sees me, therefore, has seen the Father.” (John 12:45) The light, therefore, of the face of the Lord is the Cross, through which, as a a shining lamp, the world was enlightened, and the earth was shaken, and the rocks were rent, and the dead were raised, and the sun hid itself, and the heaven clothed itself in sackcloth, desiring to show the ungrateful and ignorant and denying Judeans that the Master and Creator was truly crucified in the flesh. This grace, O beloved, I seek to praise rightly and I desire to approach the Cross, and being unworthy that I am, I tremble in my flesh and my tongue is silent, and my lips are paralyzed, and my thought within is slow to bear witness. How could I, the base one, rightly be strengthened to relate regarding the power of the precious and life-giving Cross? I speak, therefore, through a portion of God's grace which I understand, for neither are the angels strong enough to worthily praise this power. When the sign of the Cross is beheld, the angels worship, not the wood itself, but Him Who through it was willingly crucified in the flesh: Christ. Adam, through the wretched tree was condemned, and the new Adam, Christ our God, through the wood of the Cross has strengthened us. And the word of the Prophet was fulfilled, saying: “You have given a sign to those who fear You, who flee from the face of the bow.” (Psalm 60:4) The sign is the Cross on the forehead and hand of the faithful, and the bow is the error fashioned by the devil, from which the wretched ones are wounded by the arrows of thoughts with the wounds of sins. 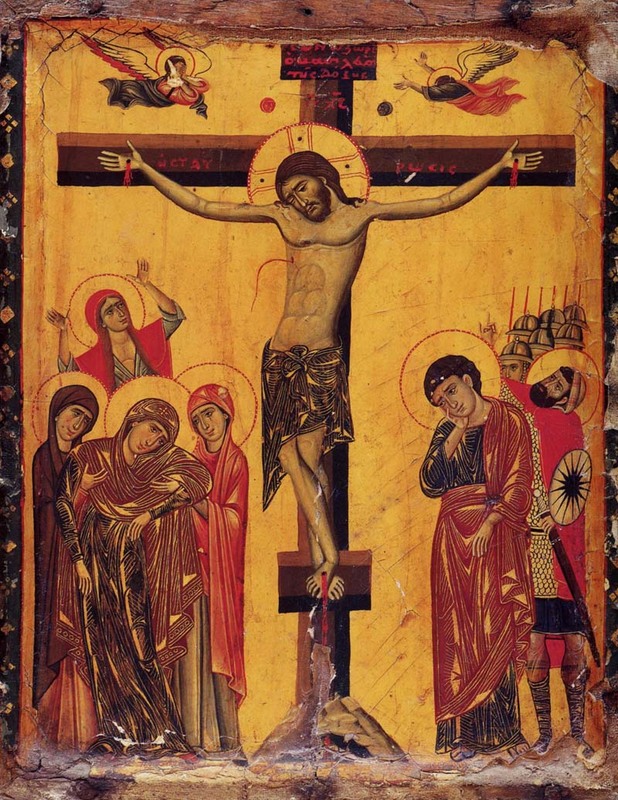 Come, O faithful, let us partake of the veneration of the precious and spotless Cross, for all living creation was seized with amazement, beholding Christ being pierced in the side, He Who is the Fashioner and Ruler of all, by the lance that pierced the blessed side, causing water and blood to pour forth as a spring that surpasses understanding, bearing the crown of thorns, drinking vinegar and tasting gall, having lots cast for His garments by the hands of the murderers, servants of the darkness and friends of the shadow, as each ran to receive his portion. The ranks of the bodiless angels were shaken. the heavens were seized with hatred. the light and radiance of the stars was extinguished. The great giant of the sun hid its radiance, and the air was filled with darkness. The day was transformed into deep night, and furthermore the radiant adornment of the temple was rent. The earth shook as if boiling, and the death were speedily freed from their bonds of the grave. The Thief dwells in Paradise through his faith and his word, and Judas mortally wounds himself by hanging. Peter is afraid to swear by the Master, and will not be saved from his error until he is driven to cry bitterly, and is cleansed from his sin. The dragon of the abyss beholding these things, cries our wailing: “O my servants and my powers, the rulers of the darkness, who has plunged a stake into my heart? I am pierced with a wooden lance, and I am torn apart. My innards are in pain, my heart is sore, my senses are corrupted, and my spirit is in agony. I should not have numbered Judas with my disciples. I should not have picked up the wood of crucifixion. I thought that I would hold it within my hands, but now I am bound by it as a slave, and all those who I held since the first-formed man, I am compelled to disgorge.” Come, O beloved, let us cover ourselves below the wings of the precious and life-giving Cross. For the four ends of the Cross signifies that He Who was crucified upon it is God over all places, and has received all from the ends of the earth. Christ God was lifted up upon it, that He might dissolve the demons that infested the air, and made our passage to heaven unhindered, as our Savior Himself told us: “When I am lifted from the earth, I will draw all men towards me.” (John 12:32) And what more should I tell you? Hearken to the word of the Prophet: “The Lord shall send you a rod of power from Sion.” (Psalm 110:2) And because this rod is Christ, as Isaiah also said: “A rod shall go forth from the root of Jesse.” (Isaiah 11:1) Moses bearing this divided and brought back together the Red sea: dividing, that the people of God might pass through, bringing back, that the people of Egypt might be covered by the depths of the sea. Creation celebrates radiantly today, receiving the Virgin as a new heaven. A girl is born upon the earth, who holds the King of the heavens in her palm. A youth comes into the light of the rays of the sun and shines brighter than lightning. A child shines from a barren womb, who is the most-sacred treasury of virginity. Who would not come out for this festival? Who would not come out for the feast, and speak lovingly of the Virgin? A beautiful gift of virgins is incorruption, bodily chastity, the giving of riches to the poor in thanksgiving, the meekness of rulers, the righteousness of kings, the holiness of priests, and the lawfulness of all in all things. And with gifts like these follow the bearing of lamps; come let us skip joyously. Let us sing characteristically with David: “Come let us rejoice in the Lord, let us cry to God our Savior.” The temple that receives the Creator of all is given refuge, that the Creator and Word might be prepared a strange dwelling, that the Sun of righteousness might be covered with a cloud of light, that He Who clothes the heaven with clouds might be clothed in the God-woven robe and raised to stand, that He Who orders times and seasons and years might be shown a bridal chamber. Dance, O youths, for it is the nativity of the Virgin. Skip, O mothers, for the motherly fruit is the Virgin. Barren ones, have hope, for she who was formerly barren later gave birth to a godly child beyond her hopes. Let no lady be absent from this choir, which crowns the crown of the Queen to celebrate her nativity. First thou didst put to flight the wild beasts of the passions, renowned champion; then by divine entreaty thou didst stop the gaping mouths of lions and the assaults of wild beasts in the arena! Thou wast unharmed by them! Thou didst not cower in fear before the fire nor the wrath of the judge, for, blessed one, thou didst prefer nothing to the love of Christ! In a young body, glorious one, thou didst put the ancient deceiver to flight! Thou didst receive the marks of Christ in thy flesh, blessed one! Now thou doest wear a victor's crown, all-blessed Mamas. And are ever illumined by the splendor of the triune sun! Thou didst behold the highest things thou didst desire with a most pure mind, as thou art joined to the choir of the martyrs! Following, victorious one, the life-bearing feet of our incarnate God, who cast down the tyrant by the passion of the cross, thou didst go rejoicing to the stadium of martyrdom! Thou wert tortured by torments; thou didst cast the boastful one to earth, destroyed by the passion which killed your flesh, martyr! As the son of those who traveled the way of the Lord, thou becamest a new shoot of the olive tree at the table of the Lord! For the Lord blessed thee through martyrdom and thou didst behold the good things of Zion on high! Thou didst ever delight in divine joy with thy parents, marvelous Mamas! By thy prayers make us partakers of this joy with them! Come, faithful! Let us celebrate with harmony the memory of Mamas the martyr! He has been revealed to us as a new Abel, for as Abel became a shepherd of sheep, bringing his first lamb to sacrifice and so acquiring the victor's crown, so the honored martyr was eminent among shepherds of livestock; through martyrdom, he offered himself to Christ as an acceptable sacrifice! Since he has boldness before Christ, he asks peace for the world and great mercy for our souls! Divine offspring of martyrs, whose godly teachings you in truth followed with incomparable longing, and you preached the name of the Savior, and were shown wondrous, O wise one, through your struggle. O glorious Mamas, entreat Christ God to grant us great mercy. 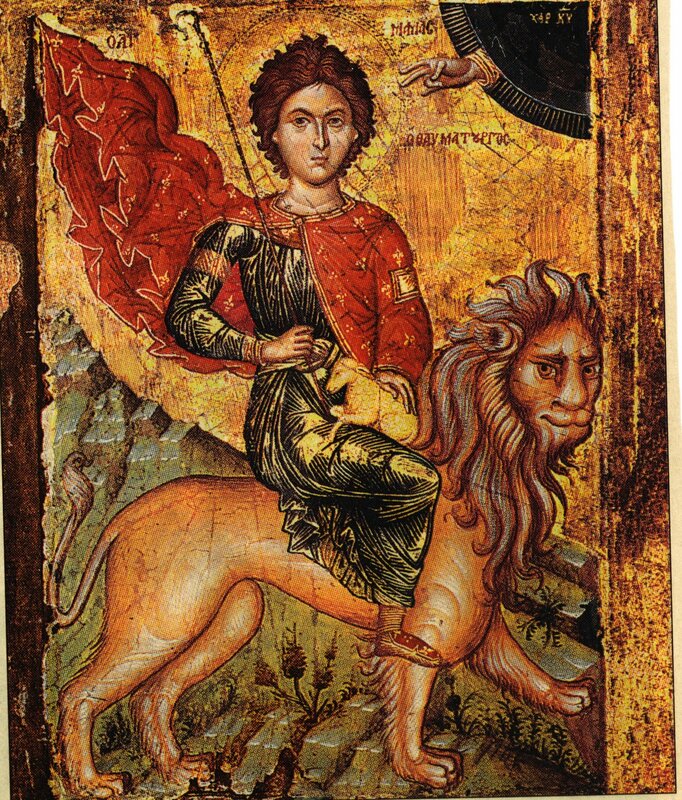 With the staff bestowed on thee by God, O holy Great Martyr, shepherd us thy people now in green and life-giving pastures; swiftly crush with godly power unseen and wild beasts underneath the feet of them that praise thee with longing; for in dangers we all have thee, O Mamas, as our fervent protector and help. The Martyr who is famed throughout the world, and dances in the heavens with the Angels, Mamas let us praise, for he who formerly milked deer in the wilderness, now and ever shepherds the property of the people of the Lord with the rod of power, surrounding as a good shepherd, and leading to green pastures, in which dwells truly the food of Paradise. Therefore all those in danger have thee, O Mamas, as our fervent protector and help.